I’ve started a new Christmas tradition. It’s called patience. I’ve learned to wait patiently in line at the post office. I peel of all my layers before going inside so that I don’t pass out from the heat. I know all the post office regulars, and look forward to a brief yet satisfying chat when it’s my turn at the window. I use the time in line to people watch. Sometimes I make productive use of the wait by addressing a card or filling out custom forms. Patience is a gift you give others, but it’s also a gift to yourself. I feel better about myself when I’m patient. I’m patient with my husband’s annual fretting over the lights. He once spent four hours on the floor of the garage trouble shooting strands of Christmas tree lights. Our boys were young at the time, and I grew frustrated with what seemed like such a waste of family time. I’ve mellowed. And I’ve come to understand that it’s his thing. He hangs lights on the tree, strings lights on the house, and replaces all the lights in my son’s Christmas inflatables. He makes multiple trips to the hardware store to find replacements. Small packages arrive in the mail containing fuses and bulbs. Mike is a fixer and that’s what makes him happy, so with patience comes an understanding. Everybody wins. I’m patient with Lindy’s demands for more and more (and more) attention, but I’m patient with myself, too. When I know I need to buckle down and get some work done, I relocate her to a sunny spot in the house and close the door. Prior to that she gets pets, cuddles, treats and a roll in the catnip, but after repeated demands for ear-scratching, I finally remove her from the room so I can get things done. I have two remarkable teenage boys requiring no patience. I guess all that earlier guidance and patience eventually paid off. They’re both delightful young men. Perhaps this tradition of patience isn’t so new at all. That said, it takes patience to cultivate any good habit, so I’m learning to be patiently patient with myself. I’m sticking with a few favorite traditions this year, too. 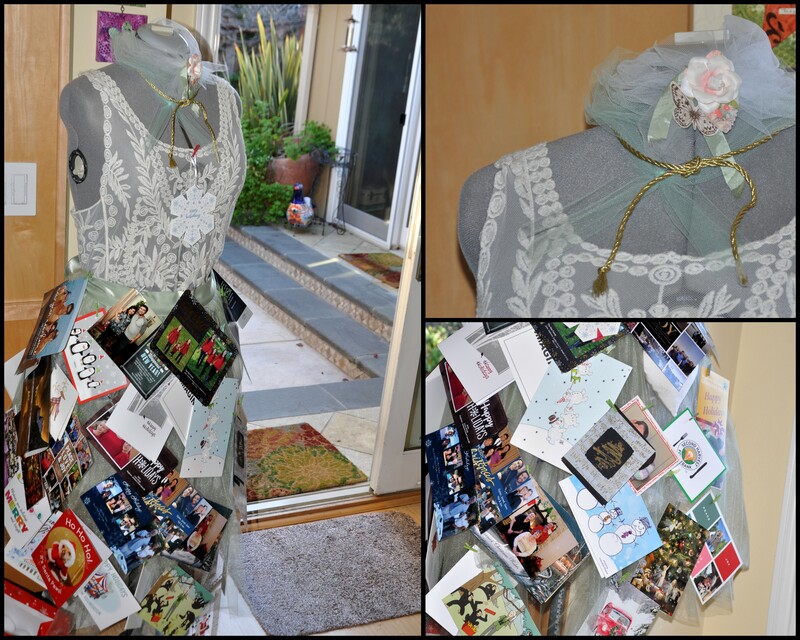 I’m adorning my dress-maker selfie with Christmas cards once again. I love putting her to use sporting all the beautiful cards we receive by mail. It’s a dwindling tradition, but we continue to send our own cards each year and love the ones we receive. The boys decorating the tree a decade ago. 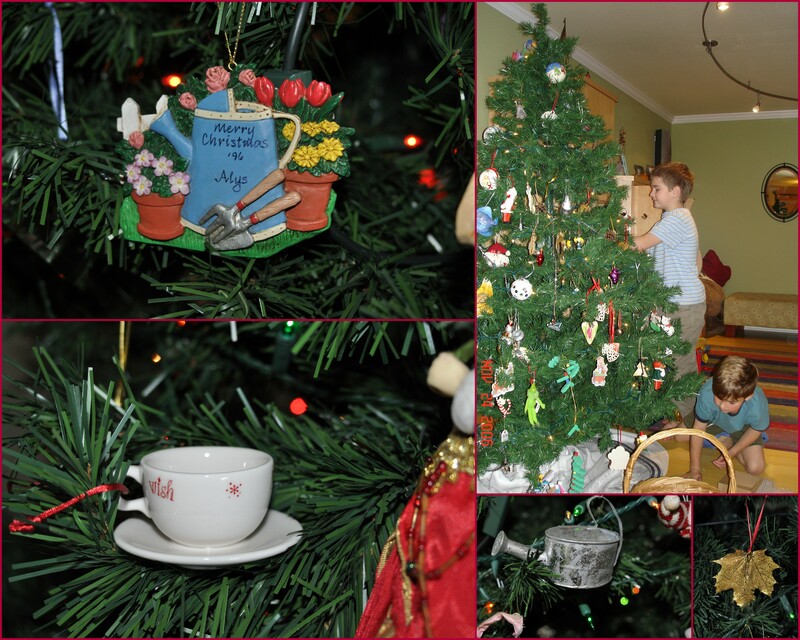 Gifted ornaments over the years reflecting my love of gardening and hot tea. We pull out our artificial tree the day after Thanksgiving and decorate it with the ornaments we’ve collected over the years. Every ornament has a story and that’s what makes it fun. We hang hand-made school ornaments from the boys early days along with ornaments we’ve received as gifts. We like to pick up an ornament when we travel, each one a fun reminder of a different holiday. Thomas the Tank Engine sits among the branches along with a hand-painted Christmas ball from Cannes France. It will come as no surprise that fellow bloggers Julia, Kelly and Marlene also contribute to the history and diversity of our tree. In the few days leading up to Christmas, I enjoy sitting in the dark, tree illuminated, grateful for the love in my life. 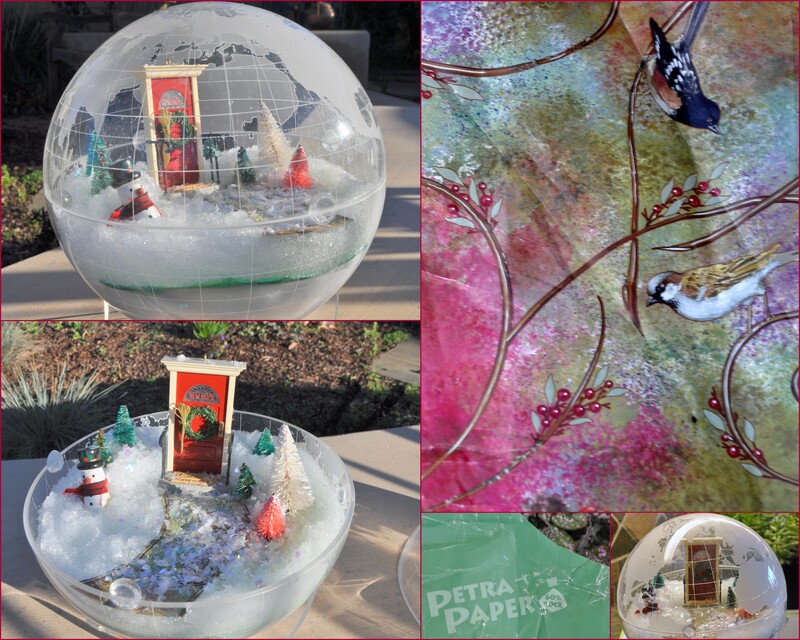 Our acrylic globe, a gift from my friend Marcia, becomes a “snow globe” this time of year. Each year is a little different from the last. Here’s the latest: I made a path using Petra paper left over from a holiday plant and some artificial snow. I added a few tiny trees from prior years and a twenty year old wooden snow man. I can squint my eyes and pretend that it’s snowing in San Jose. Tomorrow I’ll start one more tradition. I’m volunteering for a toy distribution shift at Sacred Heart Community Services. Sacred Heart will distribute over 18,000 toys and books to 6,200 children in need in our community. This is a big step for me, as I used to get mired in depression when working so closely with the disadvantaged in my community. 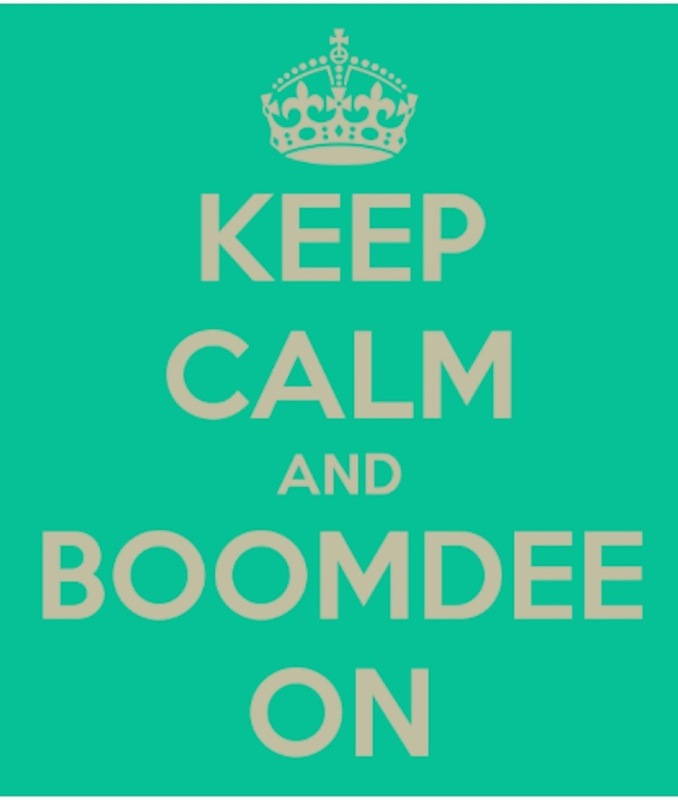 I retreated to a “safer” form of volunteering, either hosting drives, or serving on committees or board of directors. Since the election, I’ve been motivated to get up close again. The goal is to remain open, while at the same time protecting my tender heart. Wish me luck. ‘Tis the season…of Hanukkah, Christmas, Kwanzaa and Solstice; a time to share of ourselves. What are your special traditions this time of year? This entry was posted in Holidays and tagged Christmas traditions, Christmas Tree, displaying christmas cards, DIY snow globe, Dress Form Selfie, Patience, Sacred Heart Community Services, snow globe, volunteering. Bookmark the permalink. Thank you, Cindy. Happy holidays to you, too. Dear friend…..what an honest and compelling post today. …..your struggle with patience, your willingness to step away from the lights and let your husband handle it his way, your appreciation of your boys (young men), the many ways you find to decorate your home…….and the deep breath you are taking as you walk into the toy giveaway…….so impressed. I’ve worked at a number of toy and food giveaways because I never had money to give so I gave time…..I think you will come away feeling that ,while you haven’t changed the families lives in some permanent way, you will HAVE changed their Christmas this year. The mom who leaves with several toys, pajamas, a roll of wrapping paper and a bag of groceries will have some relief in her day. It will be good and you are good to step forward. Dear Mary Elizabeth you say the kindest things. Thank you for these words. You fill my heart with the joy that comes from knowing you. Your comments regarding time at Sacred Heart proved true. It was an exhilarating time for so many reasons and so gratifying to see what a difference a community can make when they come together. It’s extraordinary. Love to you, Mary Elizabeth. Thanks for your endless love and support. I love your Christmas decorations, Alys, especially because they have such special meaning for you. Isn’t it funny how somethings that are frustrating for us are just how someone else wants to do it. Oh, the patience it requires!! Anne, it’s been a wonderful year getting to know you a bit better through the Traveling Sisterhood. I’m so happy to have been a part of it. I also enjoy your teapot art on my wall every day, and a feather sketch you sent long ago. I love our connection across the miles and cherish your presence here. Merry, peaceful Christmas and wishing you, too, good health in the coming year. Having had to exercise a fair bit of patience this morning getting in some last minute groceries, I have lots of sympathy with your approach! And I’m deeply envious of your memory-filled collection of decorations. Pa tossed the family baubles when my mother died and he moved overseas. Since that time, I’ve always spent Christmas at someone else’s home until I got married 4 years ago, and I haven’t had time to build a similar collection for myself yet! Perhaps it’s too late… but at least I have my little Nativity and the little artificial tree I’ve carried from home to home in the last 13 years. Have a wonderful, happy and peaceful Christmas and New Year with your family and friends. Merry Christmas Alys. What a lovely tree. Ours too is full of memories. Sometimes I think I should go with a color theme or item theme (candy, instruments) but then I realize that my eclectic messy tree is totally reflective of my personality and has so many memories wrapped up in it I can’t make the change. Have a wonderful time during the holidays and espiecally however you choose to serve. I can tell you that you have already made an impact on one person who needed to know love more than ever. God bless you. Alys, I love this post! I need to remember the patience thing myself. As you point out, it’s a gift that comes back to us. How wonderful that you will be helping with distribution to people in need. I hope you are able to come face-to-face with these people, who help us complete the cycle of sharing that is such an important part of being human. If you look closely at each one, as individuals and not as a group, I know you will connect with many of them. Even if your lives touch only for a moment, it will be beautiful and not depressing. It helps me to remember that each person I meet has gifts about which I know nothing, and which I myself may lack. Outward appearances and circumstances can be so deceptive, and some of the richest people I have ever known had very little money or material goods. Blessings to you and your loved ones, my shining star of a friend! I learned patience after I retired and it has made me a happier person. I regret not learning it sooner. Have a wonderful holiday with your family and all your traditions new and old. Karen, you made me smile. I think any time we acquire a new and positive habit or attribute we wish we had done it sooner. I guess we get there when we get there. Three cheers for the self awareness to know the difference, eh? Our holidays are warm and restful so far. I wish the same to you. Johanna, I have been moved to tears by my sewing machine, and not in a “happy tears”sort of way. I can relate! I’m a work in progress. Happy Holidays. You have some beautiful, meaningful traditions, Alys, and you’re so smart to acknowledge and treasure them. Cultivating patience is truly a gift you give yourself, as well as others, since it means you won’t be so stressed! Enjoy your day with your family–I wish I could send you some snow! Thank you, Kerry. So far, we’re having a mellow weekend with full expectations of that continuing. I’ve barely moved from the couch, everyone is home and even the cats are settling down. Do you have your fire going? Your plans sound perfect! We have had the fireplace going pretty much non-stop, and snacks and drinks, and naps when we choose! I love this post on patience. I’ve worked on that for a number of years already. I mentioned that when I was last in the post office, the line was out the door so I availed myself of the self serve machine which many of us had never used. There was a young man in the back of the line and I enlisted his services to walk many of us through the use of the machine. He seemed pleased to be of service and we made sure to let him know he had done his good deed for the week. I know what you mean about protecting your heart. It’s hard to see people struggling and not be able to help. I have to do my little bit from a distance as well. That’s why I work at the quilting to give shelter family’s something that is all theirs. As for the ornaments, I can tell you where many of mine came from as well. If I had Kate’s address, I’d add a lace ornament to her collection too. If you have it, I could send it to you to forward. It’s a thought. I have a new one on my tree this year. 🙂 It’s just beautiful. Merry Christmas and giant squishy hugs. Marlene, you were brave to take on that machine during such a busy time, and how wonderful to ask for help from a willing, and much-appreciated young man. I’m sure you made his day. I remember the first time I used one of the machines. I’m pretty sure I broke out in a cold sweat. Thank you for understanding my reticence. I LOVE that you work on quilts year round for shelter families. There is something substantial, wonderful and personal about a quilt. I can’t imagine what a lovely gift, especially for someone with so little. Let me see if I have Kate’s email address and I’ll connect you. I know she’ll be delighted. Go with the flow sounds good to me, Marlene. One of the beauties of quilting bees was that many hands made quick work. Women had the chance to socialize while at the same time creating something beautiful and practical. Nothing went to waste. I’m reading an interesting book called The Book of Fine Linen and they talk about washing day being a place for women to gather by the watering hole to launder and chat away from the watchful eye of others. I feel like our blogging community is a bit of a modern day quilting bee, a sort of pen pal and a place to exchange ideas and to offer support. Your quilting squares are a part of that. You’re contributing to a greater whole. Beautiful thoughts and acts of patience. I’m going to give that practice some thought. I love how you say it’s a gift you give others. Thank you, Leilani! As trivial as this may sound, sometimes I just takes the proverbial “counting to ten” or physically calming your inner self with measured, yoga breaths. It’s high on the list this year as I practice mindfulness and action before a certain someone takes office and attempts to unravel 100 years of reforms. So, tell how it went during your shift at the toy distribution? I’m proud of you for pushing yourself and stepping out of your comfort zone. And truly, Alys, you do so much for others already. Laurie, I know what you mean. It’s hard for me too, when I fall behind at WP. We know so many wonderful people, with amazing blogs. It’s hard to miss out. Thanks for your kind words on doing for others. YOU set the gold standard. It was a wonderful day, busy and energizing. That place is a well-oiled machine. I will get a post together. I’m even more impressed with what they do in our community, seeing the entire operation in action and the respectful way things unfold. I’ll look forward to your note, and you in turn should have one arriving as well. Isn’t this snail mail business fun? Thank you! That means a lot. It is incredibly sad to see so much need. The lopsided distribution of wealth continues and there are days when I wonder if we’ve really come far at all from the days of monarchies and dictators. The Scandinavian countries seem to get it right. I want to take a page from there book. Thanks for your comments.